Caching is a mechanism to enhance the performance of a system. It is a buffer memorythat lies between the application and the database. Cache memory stores recently used data items in order to reduce the number of database hits as much as possible. If you issue multiple updates to an object, Hibernate tries to delay doing the update as long as possible to reduce the number of update SQL statements issued. If you close the session, all the objects being cached are lost and either persisted or updated in the database. Second level cache is an optional cache and first-level cache will always be consulted before any attempt is made to locate an object in the second-level cache. The second level cache can be configured on a per-class and per-collection basis and mainly responsible for caching objects across sessions. Any third-party cache can be used with Hibernate. An org.hibernate.cache.CacheProvider interface is provided, which must be implemented to provide Hibernate with a handle to the cache implementation. Hibernate uses first-level cache by default and you have nothing to do to use first-level cache. Let's go straight to the optional second-level cache. Not all classes benefit from caching, so it's important to be able to disable the second-level cache. 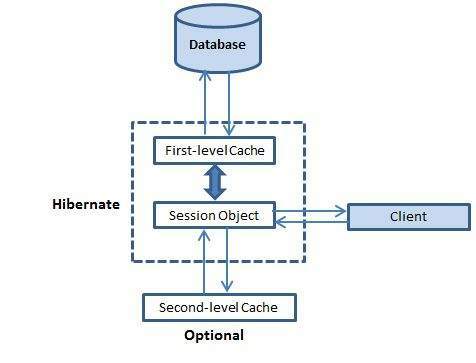 The Hibernate second-level cache is set up in two steps. First, you have to decide which concurrency strategy to use. After that, you configure cache expiration and physical cache attributes using the cache provider. A concurrency strategy is a mediator, which is responsible for storing items of data in the cache and retrieving them from the cache. If you are going to enable a second-level cache, you will have to decide, for each persistent class and collection, which cache concurrency strategy to use. Transactional − Use this strategy for read-mostly data where it is critical to prevent stale data in concurrent transactions, in the rare case of an update. Read-write − Again use this strategy for read-mostly data where it is critical to prevent stale data in concurrent transactions, in the rare case of an update. Read-only − A concurrency strategy suitable for data, which never changes. Use it for reference data only. Your next step after considering the concurrency strategies, you will use your cache candidate classes to pick a cache provider. Hibernate forces you to choose a single cache provider for the whole application. It can cache in memory or on disk and clustered caching and it supports the optional Hibernate query result cache. Supports caching to memory and disk in a single JVM with a rich set of expiration policies and query cache support. A cluster cache based on JGroups. It uses clustered invalidation, but doesn't support the Hibernate query cache. A fully transactional replicated clustered cache also based on the JGroups multicast library. It supports replication or invalidation, synchronous or asynchronous communication, and optimistic and pessimistic locking. The Hibernate query cache is supported. Every cache provider is not compatible with every concurrency strategy. The following compatibility matrix will help you choose an appropriate combination. That's it, now we have second-level caching enabled for the Employee class and Hibernate, now hits the second-level cache whenever you navigate to an Employee or when you load an Employee by identifier. You should analyze your all the classes and choose appropriate caching strategy for each of the classes. Sometime, second-level caching may downgrade the performance of the application. So, it is recommended to benchmark your application first, without enabling caching and later on enable your well suited caching and check the performance. If caching is not improving system performance, then there is no point in enabling any type of caching. To use the query cache, you must first activate it using the hibernate.cache.use_query_cache="true" property in the configuration file. By setting this property to true, you make Hibernate create the necessary caches in memory to hold the query and identifier sets. Hibernate also supports very fine-grained cache support through the concept of a cache region. A cache region is part of the cache that's given a name. This code uses the method to tell Hibernate to store and look for the query in the employee area of the cache.